Very excited to hear this, as I was expecting an album already out by the end of last year. It's good but that's all for now. It will most likely grow on me with more listens but I'm glad they're back and that this is already in the iTunes top 100. Looking forward to what else Panic! At The Disco will bring this year<br><br>EDIT: It's grown on me quite a bit over the past week. While it is similar to My Songs Know What You Did In The Dark (Light Em Up), I think it is unique enough and not a copy. Still not up there with their best though. It's a good return from Panic! At The Disco, but very different. I think if they released this before Fall Out Boy released "My Song...", then this would be viewed differently. Sounds far too similar to My Songs Know What You Did In The Dark by Fall Out Boy. Very underwhelming. Pretty average, no where near as good as some of there previous releases. Yes, it does sound almost exactly "My Songs Know What You Did In The Dark (Light Em Up)". Even Brandon's voice sounds almost identical to Patrick Stump's voice.<br><br>Overall, it's good but disappointing for an opening single release considering the first single on every one of their albums have been brilliant. Not one of their best, but could grow on me with more listens. 3.5*. Inderdaad een beetje 'Klinkt als' maar ik vind het toch een geslaagd nummer! Wenn ich sagen würde, dass ich masslos enttäuscht bin, wäre dies masslos untertrieben. Wow I don't know which song is worse... this or FOB. Doet nogal sterk denken aan de nieuwste van Fall Out Boy en helaas is dat zeker geen goed teken. 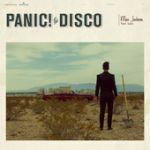 ▒ Gave 'comeback' plaat uit ½ juli 2013 van de Amerikaanse rockband uit Las Vegas: "Panic! At The Disco", bijgestaan door zangeres "Lolo" !!! Voorloper van hun nieuwe studioalbum: "Too Weird To Live, Too Rare To Die! ", die op 8 oktober 2013 officieel uitkomt !!! Drummer en oprichter van de band: "Spencer Smith" is er op 14 november 2013 overigens niet bij als zij een optreden in Paradiso (Amsterdam) geven !!! Hij kampt nog altijd met een drugs- en alcoholverslaving ☺!!! Has that Fall Out Boy feel to it but they're still going strong with this track! Not bad, and has certainly grown on me since release.